But we can’t get us none. Judging from songs and stories from the Golden Age of Piracy, rum was the drink of the common man, and whiskey the drink of the well-to-do. Part of this, of course, was because rum (which was manufactured in the Caribbean) was easier and cheaper to get. 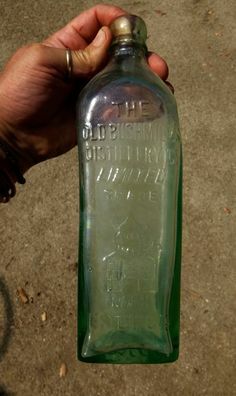 The word whiskey is a modification of the old Gaelic word uisce meaning "water" Distilled alcohol was known in Latin as aqua vitae ("water of life"). This was translated into Gaelic as Irish: uisce beatha "water of life". 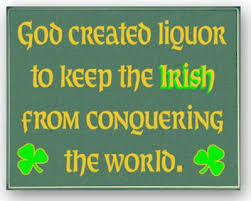 The earliest Irish mention of whisky comes from the seventeenth-century Annals of Clonmacnoise, which attributes the death of a chieftain in 1405 to "taking a surfeit of aqua vitae" at Christmas. The oldest licensed distillery in the world is the Bushmill distillery in Ireland. Even today, the Bushmill’s bottle has the date of its origin 1608, impressed into the bottle. The square Bushmill’s bottle also still keeps the original shape of a “case bottle” – a bottle specifically designed to fit perfectly (with many similar bottles) into a wooden case for shipping. The basic manufacture of whiskey involved (and still involves) coarsely grinding grain, mixing it with water and yeast, and letting it ferment. If this were left alone, the results could be drunk as beer. 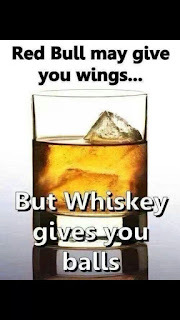 But whiskey is distilled, a process which increases pulls the alcohol out of the concoction. The science behind this is that alcohol boils at a lower temperature than water. By keeping the nix at a controlled temperature, the vapors from the liquid can be caught, cooled back into a liquid form, and kept for drinking. The classic Irish process involves distilling the liquid three times. This yields a whiskey that is about 40% alcohol. The folk-production of whiskey in Ireland produced a product called poitin. The product was produced in remote areas, away from the interference of the law. Stills were often set up on land boundaries so that the production could be blamed on the neighbors if the law showed up. The fire to heat the liquid was provided by turf. Smoke was a giveaway for the Guards (the authorities), so windy, broken weather was chosen to disperse the smoke. The still was heated and attended to for several days to allow the process to run through. The word poitín stems from the Irish Gaelic word "pota" for pot, this refers to the small copper pot still used by poitín distillers. The quality of poitín was highly variable, depending on the skill of the distiller and the quality of his equipment. A reputation could be built on the quality of the distiller's poitín, and many families became known for their distilling expertise. But a bad batch could put a distiller out of business overnight. Scotland was also a great producer of whiskey but in 1707 Scotland and England merged, and Scotch whisky began to be taxed at the same rate as English whisky. (Note – the spelling change here is deliberate. Irish and American distilleries make whiskey. Scotch and English distilleries make whisky. No one quite knows why.) The Scots hid untaxed whisky in many locations – including under church alters and kept up production by distilling their product at night. This is the original source of the word moonshine. During the 1600’s it became common practice to age whiskey in wooden barrels before drinking it. This mellowed the taste. Today, it’s required for Irish whiskey to be aged in wooden barrels for at least 3 years, though the actual product is usually aged for three times that. Whiskey was said to cure various diseases, from smallpox to a sore throat. The substance does have antiseptic properties (it’s the alcohol.) But most of the so-called curative properties of whiskey were simply a dulling of the symptoms. 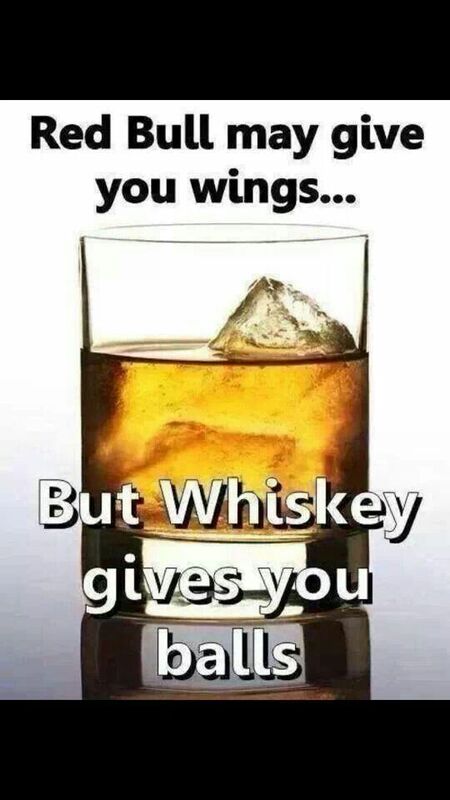 Enough whiskey can mask almost anything. Whiskey was a traditional part of Irish life and traditions. No guest must ever be turned away, and a family needed to offer whiskey to all guests. Whiskey defined the social circle. In Ireland, women as well as men drank the “water of life,” unlike many other cultures. And whiskey was the drink of choice for an Irish wake. There are even tales of the dead coming back to life in order to enjoy the festivities. The unique thing about whiskey, however was that, at the same time the lore of the drink acknowledged the harm that the drink can cause. “Whiskey killed my dear old dad,” says one song, and others tell of men driven to poverty, rags and even madness by the drink. And yet the love of whiskey lived on.